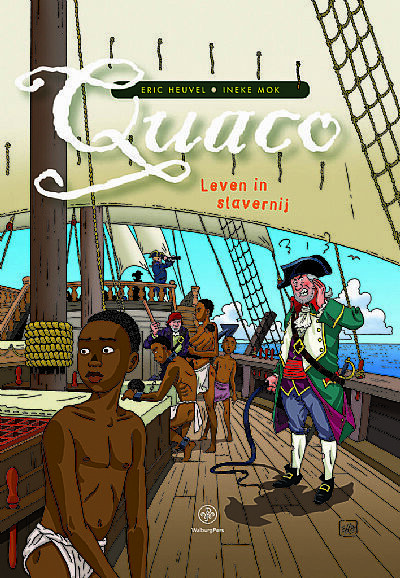 05 January 2016Quaco, the slave of a Scottish plantation owner, stars in a Dutch comic book about slavery for schools. It's time we had something like this for Scottish schools. Cartoonist Eric Heuvel and researcher Ineke Mok have collaborated to produce a comic book account of life as a slave on a plantation in the Dutch colony of Suriname in the 1770s. Published in June 2015, the first copy was presented to Jet Bussemaker, minister for Culture, Education and Science. The publication was supported by NiNsee (the National Institute for the Study of Dutch Slavery and its Legacies). Based on historical sources, the plantation owner is Walter Kennedy, whose father was minister of the Scots kirk in Rotterdam. Walter's brother was Professor of Greek at the University of Aberdeen. Quaco was then sold to the Captain John Stedman, a Scot who served in the Scots Brigade of the Dutch armed forces and who spent five years in Surinam. This is far in advance of anything available for schools in Scotland. Quaco: Life in slavery is the first major comic book about Dutch slavery. Quaco, the protagonist, is a real person. He was an Akan and came from the area which is now Ghana or the Ivory Coast. After his abduction, he first lived in West Africa in slavery, then in Suriname and the Netherlands. Quaco was one of the millions of Africans who were victims of trans-Atlantic trafficking, in which the Dutch were involved. Quaco is abducted as a nine-year-old around 1770. While his brother remains in the cells of the fort on the coast. Quaco is sold to the captain of a slave ship. With the girl Afua he manages to endure the hardships on board. They both come to Paramaribo (in Suriname), go to the wealthy planter and manager Walter Kennedy. An older slave Olive, who also lives on the property, takes care Afua and Quaco. Quaco becomes Kennedy's personal servant as a footboy. But Kennedy lends Quaco to the army captain John Gabriel Stedman, who is going to fight against the Maroons ('run-a-way' slaves) in Suriname, who are led by Boni. On the way to the interior he is confronted with the harsh life of slaves on the plantations. The military mission presents Quaco with impossible dilemmas. After four years Stedman takes Quaco to the Netherlands, where he will regain his freedom. But the price is high. He feels displaced. Increasingly images from his past loom up. Then he takes a drastic decision . . . The strip also appears in an educational edition with an appendix in which the broader context is outlined, including maps and a timeline. In the educational version there is also a teacher's guide and teaching materials. The primary target group for this educational version is students in grade 2 of Dutch secondary education. Practice shows that students from grade 3 also appreciate the comic.